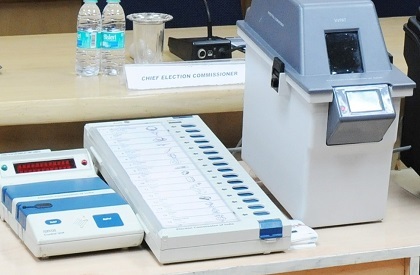 DELHI: Reports of large number of faulty Electronic Voting Machines (EVMs) marred polling for Lok Sabha and Assembly bypolls in different parts of the country on Monday. In Kairana constituency in Uttar Pradesh, there were reports of as many as 140 faulty EVMs and the VVPAT (Voter Verified Paper Audit Trail) machine(s) developing snag. As a result, voting slowed down or stopped at many booths in the constituency. The Opposition has alleged that it was a deliberate ploy and part of a conspiracy to ensure that the ruling party wins the election. They said that tens of thousands of votes could be manipulated and made allegations of rigging and misuse of official machinery in the entire process. The EVM malfunction was not limited to Uttar Pradesh. In Gondia-Bhandara Lok Sabha seat, where too bypoll was held, machines were not functioning at several places. The voting was cancelled at 35 polling booths. But the situation was worst in Kairana LS constituency and Noorpur Assembly seat. Tabassum Hasan, the RLD candidate, complained about harassment of voters also. Besides, she has complained to CEC, about EVM-VVPAT failure in dozens of booths in Shamla, Gangoh, Nakud, Thanabhawan and Kairana. The figure of malfunctioning EVMs was termed to be as high as 300 by NCP leader Praful Patel. In the searing heat in most parts of the country, already voters had a tough time, and vote percent was likely to fell in places where voting either slowed down or stopped. Even EVMs were reportedly affected by the heat and didn't function properly, said officials.